2. Computer control, high precision. 3. Advanced CPU control system, the microcontroller can control the speed, time, temperature and relative centrifugal force. 4. Efficient use of strong fluorine-free refrigeration systems, environmental compliance, temperature control range of -10℃～+40℃, in the stationary state can also be pre-cooling of the rotor. 5. Maintenance-free variable frequency motor speed is more accurate. Step by centrifugal speed and centrifugal force adjusted to 10mg/10×g. 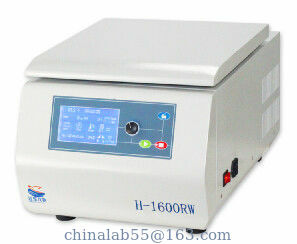 0-time control 99hours 59 seconds, accuracy±1second/continuous centrifugal/transient centrifuge. 6. Stainless steel cavity, solid construction, suitable for continuous use, inflatable spring, easy open lid, automatic locking lid to ensure safe. 7. German import 5-inch large-screen LCD display. Rotating single-button control, easy to operate. 8. With door protection, speeding, over-temperature unbalance protection, can process real-time monitoring of the centrifuge to ensure the safe operation of equipment. 9. Rotor with super-hard alloy with a special process, with unlimited high-temperature sealing performance and disinfection functions. 10. Angele rotors with sealed, horizontal rotor(Biosafa rotor) to prevent sample contamination by staff. 12. German-import 5-inch large-screen liquid crystal display LCD, which can display set and actual values of parameters, with all parameters clear at a glance. 13. Single-button is for spin control, button for option activation, revolving for alternation of option parameters, and the other three buttons are only for startup, stop and cover opening. 14. When the operation finishes, error and imbalance appears, the voice signal will cue, stop the operation and display in the LCD by text at the same time. 15. 10 gear for take-off and landing speed (0 gear for freedom parking), 10 program storage.